H.E. 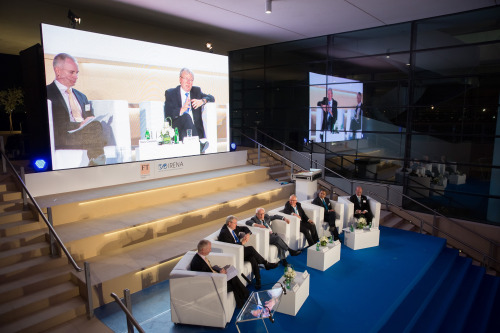 The Honourable Kevin Rudd, 26th Prime Minister of Australia, discussing the "REmap 2030" report at IRENA's FT Question Time in Abu Dhabi recently. Panelists included Michael Eckhart, Global Head of Environmental Finance and Sustainability, Citigroup; Dr José Goldemberg, Professor, University of São Paulo; Paddy Padmanathan, President and CEO, ACWA Power International; and Prof. Dr. Klaus Töpfer, Executive Director, Institute for Advanced Sustainable Studies (IASS). The REmap 2030 study maps out a pathway for doubling the share of renewable energy in the global energy mix based on the technologies that are available today. Energy efficiency and improved energy access can advance the share of renewables in the global energy mix up to 36 per cent, according to the new report. The deployment of modern renewables – renewable energy sources that exclude traditional use of biomass – needs to grow more than threefold, the study shows. What's also required is a rethinking of energy taxes and subsidies, which is critical to the economic case for renewable energy. Furthemore, a reduction of fossil fuel subsidies will facilitate the uptake of renewables, and subsidies for renewable energy can disappear altogether -- if green house gas emissions and other air pollution are reasonably priced. Dolf Gielen, director of IRENA’s Innovation and Technology Centre in Bonn, Germany, believes many governments are underestimating the potential of renewables in their planning the for energy transition. "To reach the goal of doubling the share of renewable energy by 2030, additional efforts are needed, particularly in the building, industry and transport sectors,” Gielen explained.